Includes skeleton dress with polka dot trim, leggings and glovettes with screen-printed bones, and two bone clips for the hair. Skeleton Girl Kids Costume includes skeleton dress with polka dot trim, leggings and glovettes with screen-printed bones, and two bone clips for the hair. 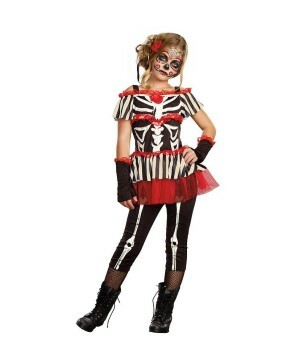 This scary Skeleton Costume for girls is available in kids sizes Medium (8-10), Large (10-12) and X-Large (12-14). Dressing up as a skeleton is nothing but cool!Please note wig and shoes are not included. 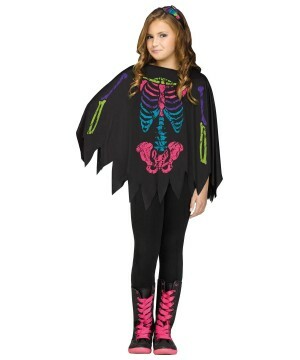 The Skeleton Poncho Girls Costume brings one poncho. The Skeleton Girls Poncho Costume brings one poncho. 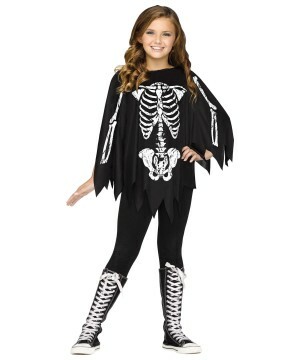 The Girls Skeleton Costume brings a dress, a pair of leggings, a pair of arm bands and a headpiece.